This post explains how to increase your blog traffic by submitting your blog to different kinds of blog directories which rates,provide statistics about your blog and provide free traffic and maximum exposure to your blog. Submitting your blog to these directories is a very good thing to do particularly if your blog is very new one with low traffic. 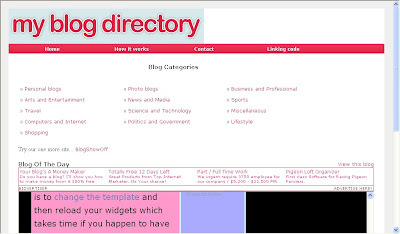 These blog directories have high pageranks than your blog(since your blog is a new one with pagerank Zero).So, if someone searches for a particular keyword,there is more possibility for the blog directory to appear in the results than yours.So,by adding your blog to these directories,the visitors enters these directories containing your articles(when they click the article,they enter your site) and also your blog posts will be indexed little faster.So,submitting your blog to these directories will gain you more traffic. (If your blog is a new one,then put a visitors tracker button in your blog,sothat you will see how many visitors are coming from these directories,from search engines,visitors geolocation,etc). Before submitting your blog to these blog directories,my personal suggestion is to create a new email address for this purpose so,your personal emails can't flooded with the emails from the blog directories administrators,etc. )Creating an email is free lol....creat one. Many of these directories asks you to register before submitting blogs. There are so many hundreds of blog directories,here is the list of very good popular directories which will send you maximum traffic. 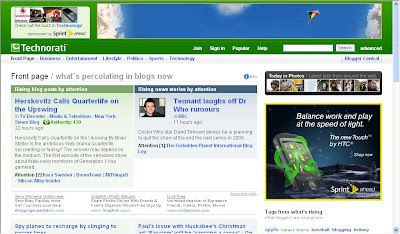 Technorati:Technorati is the largest blog(weblog) directory currently tracking more than 112.8 million blogs.Join technorati and verify your authorship,then you will be provided with detailed statistics regarding your blog,how many blogs are linking to your blog,(they call it 'authority').It is one of the best blog directory and will send tons of triffic if your blog is regularly updated. Topblogarea:This is another big blog directory which rates and rank the blogs interms of Unique visitors your blog gets.They start the counting from Zero every week, so that even newly submitted blog can have the chance to rank higher in the list. Topblogging.com:This is another source of weblogs which also rank the blogs according to the unique hits they get.Nice blog resource,bring you lots of traffic to your blog. 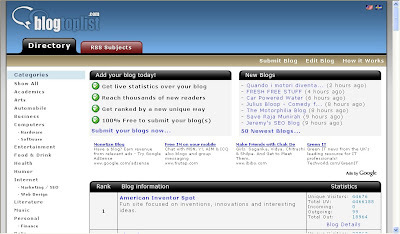 Blogtoplist:Same here,they rank according to the unique hits you get.But,there is a little change, they will give you to place a voting button in your blog.If any visitor votes for your site from your blog,that is equal to 100 unique hits,but there is only one chance per visitor(one IP address) a day. 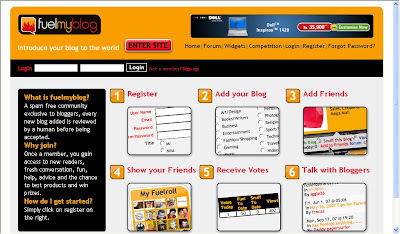 Fuelmyblog:This is a cool weblog resource which is different from the ones we discussed so far.You can vote to other blogs and others vote to you.They will keep the top six blogs(voted the most) on the homepage.You can join their forums, read other blogs content,joining in the compitetions and win prizes,etc. 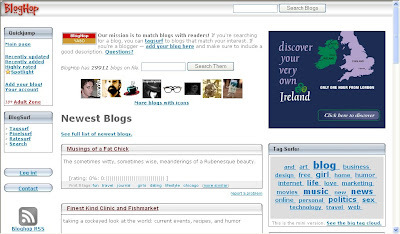 MyBloggingarea:This is a very good weblog directory which ranks the blogs accoring to the unique visitors they get,brought me so much traffic to my celebrity blog than all the other blog directories.I recommend this. 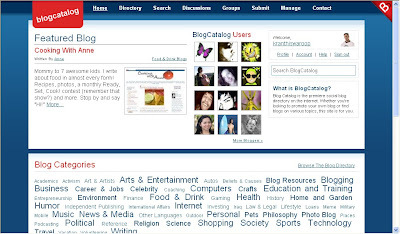 BlogCatalog:It is another good blogging resource,you can promote your blog here for FREE,find other blogs related to yours,etc.They have a special formula to rank the blogs,the more visitors,hits,comments,neighbourhood you get the more your rank will be.Another recommended one.You can join their forums,discussion board,groups,etc with other bloggers and share your thoughts. 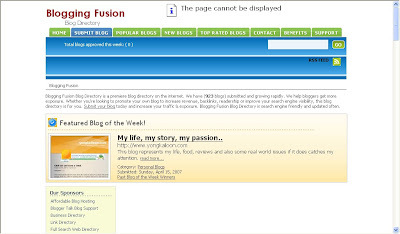 BloggingFusion:It is a new one and not a very big one(around 950 blogs) at this time.But,it is a good one and doing pretty well.You can increase your blog exposure, worth a link to it. 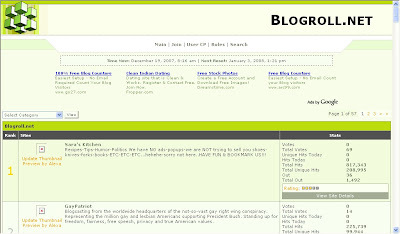 Bloghop:You can find blogs related to your blog topic here.Have a nice tracking button and currently having more than 29,000 blogs. 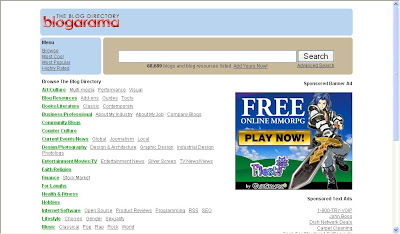 Blogarama:Cool weblog directory currently having more than 69,000 blogs.It will list the blogs in terms of the score your blog have.The score depends on so many things like incoming traffic,outgoing traffic,user ratings,etc. and if you send more traffic to they,they will list your blog in the top 100 blogs. Topbloglists:Another blog directory which will rank your blog according to the unique hits your blog will get. Myblogdirectory:This doesn't list blogs interms of any visitors,etc. All blogs are listed randomly so,every blog get the same exposure.If you sent more traffic from your blog to them,your blog will be choosen as a BLOG OF THE DAY which will be placed on the homepage and your blog will recieve the whole traffic their site gets on that day. Blogroll.net:Another blog resouce which rank accorking to the votes and unique hits your blog get. Nice reviews, there are many out there, my advice is stick with one you are most comfortable with and really make the most of that community. It's really wonderful. Very much informative and useful. Really helped me to improve my blog. .I don't have any hesitation to recommend this blog to blogging community. I so far had not listed blogs in blog directories, will do now. Thanks a lot. I use Blog Catalog and MyBlogLog. I can socialize with other bloggers there. Thanks for the list. I'll see if I can register to the other sites listed above. Thanks again. Got a nice blog.Keep blogging. 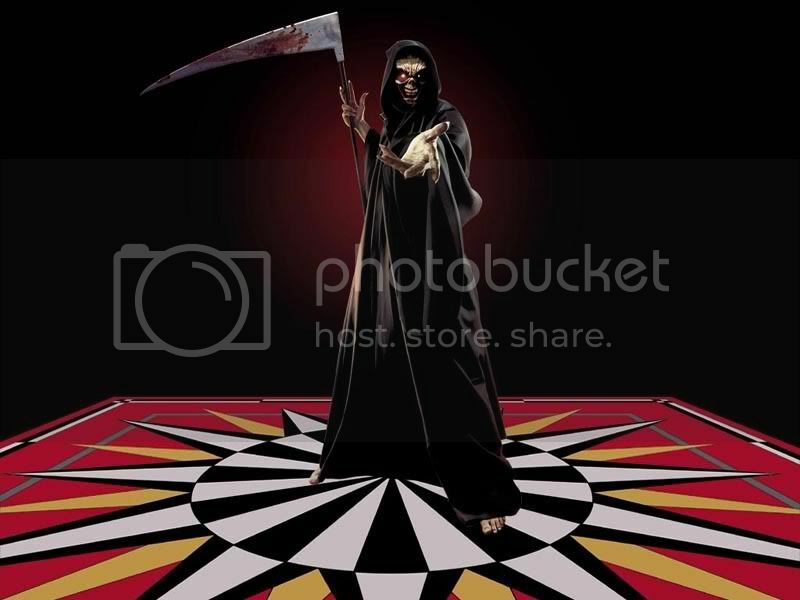 check out my blog k..
all about window xp tips and trick van be found here..
First i would like to say you have the best site i have found so far, everything so say works perfect, no fuss. Now if you can explain how to get indexed in Technority i would be gratefull. I write a blog almost every day, i now have comments and links on my blogs. I got a code from a web site to put Technority Authority on my blog yet when i go there its as i dont exist ? 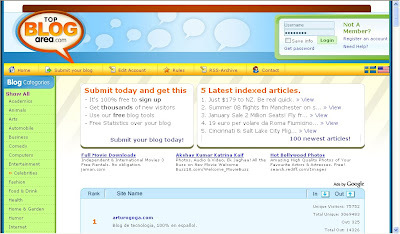 To get your blog indexed in Technorati, first you have to register with them.. go to their site and register.Next, you have to add your blog and verify your ownership.From then, your blog posts will be automatically indexed.If they are not indexing fast, use the "Ping" option which is at the bottom of their site and type your blog address and submit.It makes the process more faster. thanks for you helpful tips. thanks. your tips are too helpful for newbie like me. Thanks a lot. Thanks I always look for this kind of traffic tips. Holidaymasti is one of the leading Inbound Tour Operators specializing in quality tours within and around the majestic landscapes of India. Our network in India and the neighboring countries of Nepal, Bhutan, Tibet and Sri Lanka makes us the choice of each and every tourist, who intends to visit India with the spirit of leisure or adventure in his heart and a passion for exploring the welcoming invitation from India. Get Heavy Discount on National & International Tour Packages. thanks for ur tips..it's really help me alot.. 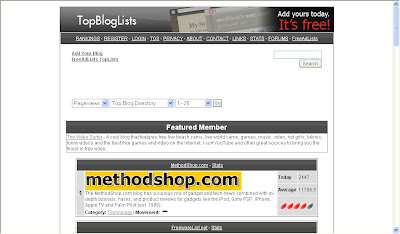 Fantastic tips, I found blogcatalog to be by far the best along with technorati. You rock, I absolutely enjoyed all your tips. You are one of the best! thanks a lot for your post..it's really clear and helpful especially for newbies. Great advice, thanks for the tips and info. Thanks for the listing of directories. HEY DUDE HOW TO ADD THAT HTML CODE WHICH THEY GIVE US AT LAST FOR RANKING? DO WE HAVE TO ADD IN HTML/JAVA WIDGET IN BLOGGER? BUT I TRIED IN EDIT HTML ITS NOT EXCEPTING SO PLEASE TELL WHERE TO ADD IN DETAIL..
don't forget about submitting to some good directories like dmoz.org , vitaldirectory and www.livearticles.info these also increases your site traffic to a considerable amount.after all submitting to these doesn't cost you anything. i m trying to put some html code 2 my page,but unfortunately nothinh is stored in my blog?so wht wil i do?tq.. Seems MyBloggingArea.com doesnot exist. Can you please let me know the new one, if it has got changed? Thanks for the tips on directories. Was quite helpful. i am going to add my blog right now. hey try http://pingomatic.com/ its help a lot because it submit/ping your blog to many blog directory service so have a nice try!! i am a part of blogger.com and i would like my comments to appear to everyone when they visit my blogs. just like this page im typing on. how do i do this? i would like for people to see all of the comments on my blog right away and not have to click on "comments" to see the other peoples comments.. Thank you. I really appreciate that you have put all this information in one place. Thanks for the useful tips. Happy New Year! great list, and thanks for sharing! I will start adding my blog right away. How to make "comment field" like your's? groovy information, thanks a lot! Thanks for your tips.It helps me lot. Excellent resources and tips here! Many thanks for your generosity. I think your PR 6 is well deserved! Cheers! Any recommendations on how to take traffic up the next notch? I've worked with LinkedIn and have gone from nil traffic to over 1,200 page visits per week in a month. The next stage is to double that number. Any recommendations on which of the above will add that kind of fuel to our formula? Our speciality topic is "Anti-Recession Movement". We're publishing success stories and tips from companies beating the recession. We've had over 20 countries participate but we want to go bigger yet. Have just signed up with your recommendation on blogcatalog.com. Considering it has an Alexa ranking of 513 it stood clearly above all the other recommendations as having some the thee highest traffic and success formulas. I've takend the paid route on one of their premium services and am hoping for great results. Thanks for the insight, I wouldn't have found it without you. I have also submitted to all the blog directory you suggested.. waiting .... for results... I am sure you are correct as always. Nice list. Would you mind adding http://blog-storm.com and http://humor-blogs.com when you have a chance? Thanks! Thank you for this trick.I used to visit your blog.At least once a day.Please visit my blog and help me make it a good one on this vast internet website world. By the way please tell me a way to a way to add online support widget for the visitors.How can I show that I am online or not? Thanks, great list. I learned a lot from your article and suggestions. Thanks for this... perfect for new comers! Thanks for sharing the list of directories. Please write about "dofollow" and "nofollow" directories. WoW nice list. That really helped. These are high PR sites and are very useful.